We love baking, well I love baking and my partner loves eating so we were thrilled when we were asked to review Renshaws new junior home baking range. How could we say no? 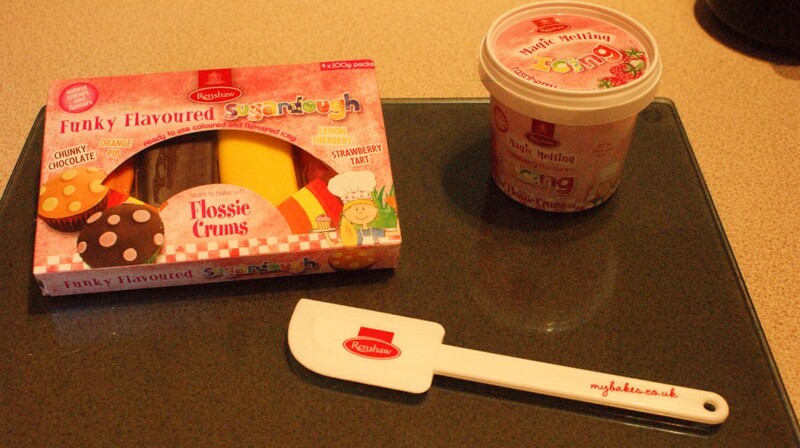 We received a pack of Renshaws Funky Flavoured Sugardough and a tub of Magic Melting Raspberry Icing as well as a spatula for spreading the icing onto our baked delights. The packing was rather cute and would definitely catch my eye in the supermarkets. targeted at children the packaging is brightly colored with images of Flossie Crumbs from the children’s baking adventure series. My partner AJ was rather excited about the four great flavours in the sugar dough pack which consisted of Chunky Chocolate, Orange Pip, Strawberry Tart and Lemon Sherbet. The sugar dough was hard in the packet but was extremely moldable once it had been kneaded into a soft dough, it could be crafted into sugar dough freehand animals and shapes or simply rolled out as a cake topping and cut out with cutters. Unlike any other sugar dough I had used before the flavours were very vibrant and rather tasty. They are 100% naturally coloured and flavoured so you know that there are no horrible nasties. Next came the Raspberry Melting Icing, it was very easy to work with, simply following the instructions and microwaving the pot for 30 seconds so that we could use it to decorate our cakes. 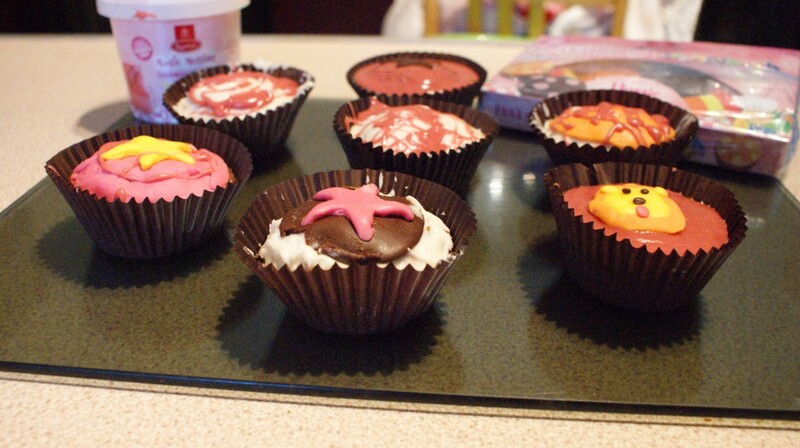 The Icing had a zingy raspberry flavour which made a nice change from the super sweet icing. It also sets quite hard so there is no mess when it comes to removing from the cases. Isabelle sat in her high chair as we baked cupcakes and then attempted to decorated them in an attractive fashion. 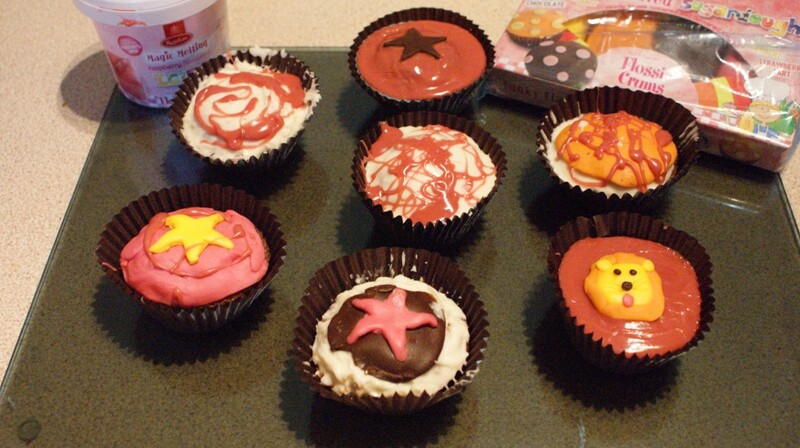 Unfortunately with her dad around I wasn’t able to get the look that I wanted as he insisted he decorate them. Using a mixture of the Raspberry melting Icing and decorating with the Sugar dough to make some great tasting flavour combinations we had baked our very own cupcakes. It has to be said we had lots of fun baking together as a family and I cannot wait until Isabelle is old enough to join in with us. I was very surprised at how little we had used to decorate our cakes, baking 18 in total. We still had more that 3/4 left of the Renshaws products making them excellent value for money. I will definitely be buying these to bake more often and also some shaped cutters so we can make lots of fancy looking designs. Renshaw Magic Melting Icing is available in Tesco for £2.15, and the Funky Flavoured Sugardough is also available in Tesco for £2.79.